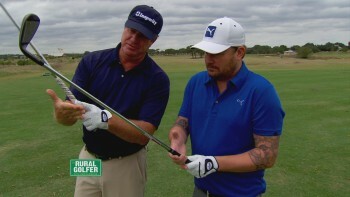 In this episode of The Secret Golf, Steve Elkington visits with Randy Rogers Band and professional golfer Shannon Fish, first ever episode put together through social media. 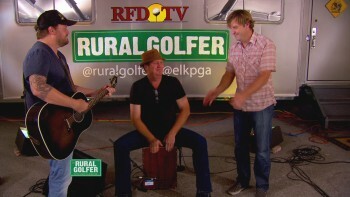 NARRATOR: You're going to flip for this episode of The Rural Golfer as we connect the dots on how social media brought together a fish, an elk, and a band. STEVE ELKINGTON: It was the first show we put together through Twitter. -We were watching Rural Golfer, and I'm a huge fan of Randy Rogers Band, and we, kind of, got the wheels rolling, and it was, like, this would be such a great idea. THEME SONG: One, two, three, four. We've got the Big Show revving to ride us around the map. Where we're going next we just can't say. Right at the club. Let's hit some balls. We're making friends and playing golf. The Rural Golfer's coming your way. NARRATOR: This week, we're at River Crossing Club in Spring Branch, Texas This tranquil escape just north of San Antonio is home to a surprisingly high number of musicians including members of the Randy Rogers Band. RANDY ROGERS: Once you come north to San Antonio, you start seeing the hills, and the countryside, kind of, opens up and, you know, they call it the Hill Country. And the people that live here, they're all about a good time, you know. And dancing and country music is just as much a part of this atmosphere and this environment as barbecue is. -A beautiful place, River Crossing here. The greens are unreal. There's so many deer here, and it's just a wonderful a place to come. RANDY ROGERS: There's a community of musicians that live here. I'd like to think it's the beautiful atmosphere. It's almost like a resort town where people go to vacation. NARRATOR: So you might be wondering just how we happened upon this little vacation spot. STEVE ELKINGTON: A, kind of, a unique thing happened with us, you know. We were introduced to the Randy Rogers Band through Shannon Fish. It was the first show we've done that was, sort of, put together through Twitter. -Shannon's the one that started it. Hey, Elk, you got to do this with the Randy Rogers Band. She tagged me in it, so I was, like, you know, I love golf. And, man, this will be cool. -She set up this whole day, and her and I, we go way back. She's grown up at the Champions Club in Houston. And she's friends with my son, Sam. And she's a great, great friend. University of Texas is the only thing I can find wrong with her. -Oh, come on now, pro. SHANNON FISH: The idea came to me because I was sitting on the back porch at my parents', and we were watching Rural Golfer on Sunday morning together. That's kind of our thing when I'm in town. And I started thinking, you know, about things that Elk could do with this show, and then I thought about people that I knew. And I'm a huge fan of Randy Rogers Band, and we've been friends for a long time. And I knew Les, the drummer, really enjoys to play golf, and he's a decent golfer. So I was, kind of, got the wheels rolling, and, like, this would be such a great idea. -We do try to play a lot on the road. -So you get some guy, you come out here, and you guys play. SHANNON FISH: I'm on Twitter, on my phone, saying, Elk, what do you think? These are my buddies. I think it would make for a great show. -Shannon Fish and I have been friends for four or five years. She's taught me a lot about golf. She caddied for me at a pro-am event that we actually won. We've had some fun together on the golf course, and I guess their relationship and her knowing our band, and, obviously, knowing Elk, kind of, that was the glue that put this whole thing together. LES LAWLESS: The wonders of social media. Everybody is connected to everybody now. SHANNON FISH: And then Puerto Rico. -And then you went to Puerto Rico. -And now you're going to be in finals at Tour School. -So, we're pulling for that, Randy, right? SHANNON FISH: Ready to get up to the big, like you guys. -Go ahead and grip the club for me, though. Your left hand grip's pretty good, but your right-hand grip's pretty average. -Just go and put that left-hand one on there. Put it down there where you feel good and normal. -That's your grip there, right? -So this hand's pretty easy to get on for golfers. This one's harder to get on. And this hand here's got a lot to do whether you're going to be any good or not. You grip this one down here in the fingers. We want it more in the tips. That male/female there. This, we want there. They very much know what they're doing, here. So when you start talking to them about their fingers and what they're supposed to be doing, hey, makes sense to them. I'm going to explain this to you, and tell me if you agree or not. I mean, if you put your grip under here, like this, when you throw it up here, it's going to twist this clubface around here, right? If I spend all my time there, and I get that grip really correctly put, that club will swing up here and be square. So who's got a better chance? If that's square up top, it's got a good chance that it's going to hit it square, right? I didn't really have to do too much with Randy today. I didn't really-- I adjusted his right-hand grip, but the re-- I adjusted it, but I told him why I was going to do it and how that made the club sit square. Your left hand is good. We always say, God was a golfer because-- that might be a song. That could be a song. -That could be the name of a song, God was a golfer. -God was a-- is a golfer. So we said it put lines on our hands, a grip right down there in the tips. On the first and second lines where that club should fit, and then that hand comes down. So that little male/female situation comes down there. -Pinky, pinky yours? Your pinky, I'd rather it sit on top-- no, I don't want you to do that. I'd rather it just sit on top in that groove there. Does that feel all right there? -So it can look like this. It just rides extra. And then it just sits in the crease there. RANDY ROGERS: He showed me his grip. And I applied that today. And I was able to use my right hand to push the ball down the fairway. And it made it easier. NARRATOR: So just what does this crazy game mean to our guests this week on The Rural Golfer? RANDY ROGERS: To me, it's a release. It's a way to get out in the woods, and walk around, and have fun with your friends. I'm competitive in other things in my life, but with golf-- for me, it's always been a game, and I treat it as a fun thing to do. -The best relationships and the friends I have had, and I continue to have, some over 20 years, have started, some of them in a random pairing of a foursome, on the golf course. STEVE ELKINGTON: So have you been playing golf all your life, mate? -I grew up going to the course with my granddad. And he played every single day. -My mom was a professional golfer. And she played on the many tours for a while. And then my dad was a bull rider. And so I, kind of, took the golf route. It seemed a little more appropriate, a little bit safer. -Typically I can go out on stage and not even think about what I'm doing and do it pretty well. With golf, since I'm not good at it, I know that when there's people lined up, you know, down the fairway, and I'm teeing off at a pro-am or something, I might actually kill someone. There are quite a bit of nerves going on. LES LAWLESS: Being in a band, living on a small tour bus with 11 guys, this gets me out, off the bus, away, and I just love it. SHANNON FISH: Les plays a lot of golf. And he takes it seriously. I mean, he works on his swing. He's got his little girls playing golf. He's just, you know, kind of, one of those rural amateur golfers that, if he's not on the road, you can probably find him here at River Crossing, playing. STEVE ELKINGTON: What do you think about Shannon's game there, boys? -Looks pretty good. It's consistent. SHANNON FISH: When I was in college, I realized how important it is to be around people that are great. Whether it's music, golf, owning a business, whatever it is. You become more like the people that you surround yourself with. And the fact that Randy's a great musician and Elk's a great golfer, I want to be that great. There is something that makes them great at what they do. And that's something that I continuously try and find, you know, whether I'm hanging out with them or playing golf with them. Because that's the level that I want to be at. -Drum-- you've got drummer's hand. He told me. STEVE ELKINGTON: We're going to play 15, 16, and 17. This is a partnership right here, against these two. LES LAWLESS: Me and Shannon, Elk and Randy. One tour pro per band member. STEVE ELKINGTON: We're all going to hit. We're going to pick the best one out of us, and we're going to go from there, OK? Loser has to jump in the pool. -I was almost as nervous today as I was when I was on both of the Big Breaks. Because the cameras are rolling and you want to look good for TV. You want to hit good shots. And then now Les was depending on me to get us off to a good start. SHANNON FISH: Got us on the green. So I was thinking OK, now we have applied a little bit of pressure. LES LAWLESS: I can only take Randy by about 20 strokes on the golf course. Blow, wind! STEVE ELKINGTON: That was high. SHANNON FISH: Except for that satellite. SHANNON FISH: Fun in the beach? STEVE ELKINGTON: The first hole, I was in the bunker. And Randy-- look at my man! Came out of his shoes on a 5 iron. SHANNON FISH: He has come to play. STEVE ELKINGTON: And he surprised himself and knocked it on the back edge. RANDY ROGERS: That was a good-- for me to get that one out of the way. Calm my nerves. 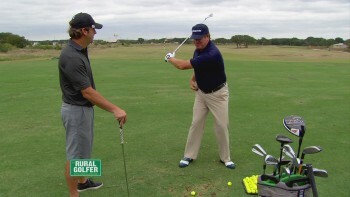 STEVE ELKINGTON: What did you do, you hit a 5 iron? RANDY ROGERS: I did. A 5 iron, and now my nerves are calm. And we're going to go chip the sucker in. It gave me a lot of confidence going into the rest of the holes that we play. LES LAWLESS: Me and Shannon were the only ones on the green. SHANNON FISH: Slow down. Slow down. STEVE ELKINGTON: Might as well just go ahead and-- ooh! RANDY ROGERS: I think our second shot wound up closer to the hole than theirs, but I was, like, well let's just call this good. Let's call it even. STEVE ELKINGTON: OK. We'll call this hole tied. SHANNON FISH: Great. All square. After one. -So, I don't know. There might have been a momentum swing there, I think. SHANNON FISH: I was going to go down the left side because the pins cut on the right. STEVE ELKINGTON: Oh, yeah. Beautiful. SHANNON FISH: I was going to give us a better angle into the green. RANDY ROGERS: She might get the long drive. SHANNON FISH: Les hits a long wall. STEVE ELKINGTON: OK, Lawless. I just like saying that name. -Swing for the fences because I have it to play. LES LAWLESS: I'll swing. I'll come out of my shoes. -But I told him, you know, hit chief. We got to get up there by the green. Because I knew Elk was going to bomb one. LES LAWLESS: My partner is dead center of the fairway, so I just try to come out of my shoes. And it didn't work out. STEVE ELKINGTON: Oh, look at my partner go! RANDY ROGERS: I let it rip, and I got through the trees and through the bunkers. SHANNON FISH: I think he's going for it. STEVE ELKINGTON: That might be on the green. Oh, that's well played. That's an unreal shot. SHANNON FISH: Les hit a great approach shot. Just below the pin, a little bit on the left side, to where we're going to be putting uphill onto the green, which is great position. -Elk's drive was a lot longer than anyone else's on that hole. So he had a little bit easier of a chip up. STEVE ELKINGTON: Ooh. A little bit short, but it's all right. SHANNON FISH: Elk needed to hit it close. And of course, he did. Although they were still away. Just like that. Good putt. -He read the putt for me, but then I knocked it pretty close. STEVE ELKINGTON: Oh! Where'd that go? Where'd that go? RANDY ROGERS: I'm pretty sure he did that because I showed him the line. SHANNON FISH: I look at Les, and I'm thinking, I don't want to jump in the swimming pool, so we need to make something happen here. Pars do not win championships. This is a championship. This is one of those defining moments on Rural Golfer. STEVE ELKINGTON: One bullet. We missed the bullet. SHANNON FISH: It broke more then we had read it to. So I'm thinking, OK, I'm going to play this a little bit farther out to the left and let it die in the hole. -Hey this-- this ain't the Big Break, you know. -So we're upstairs here, right? We got everything at the top. Now right leg straightened, and our left knee's right at the ball there, right? The first thing is that left knee comes back. First thing. Left knee back. Back, back, back. Right elbow is in against the rib cage. Bang. OK? So it's bang, bang. Now as this comes around the corner and the right arm unfolds, now we can use this-- where's-- Mike, come here. So now we can use this as a lever. Just turn around. Just stand right there. So, most everyone's up here. We're using this motion to hit with. As I come up, the ball here-- I'm up. I'm creating a sling. Now I get it against me. Now I can use that motion. There's a tremendous amount of leverage in golf. -Pressure. Pressure. Feel it. Feel the pressure. RANDY ROGERS: Got the board into It. -All right. Here we go. Here we go. -I felt-- I have-- you know, the golf. The golf. Trying to get the golf to come out a little bit. STEVE ELKINGTON: You go ahead and get one down there. STEVE ELKINGTON: Three sheets down the middle. RANDY ROGERS: That way you can just rip one. One of my friends that was watching us film today actually said that might be the furthest he's ever seen me drop a ball. So I have to say thanks. Because I actually did use the new grip. -We are one down going in the final hole. We have to make eagle. STEVE ELKINGTON: That's a good drive. SHANNON FISH: I get one down the middle of the fairway. So again I'm telling Les, just bomb it. RANDY ROGERS: Probably was-- he was trying to hit it as far as he could hit it. He came out of his shoes because Elk had put one down there pretty far. And I think they were, kind of, having a competition. -If it would have been in the fairway, it would have been 50 yards past me, but it wasn't in the fairway. SHANNON FISH: They get down there, and I'm walking up there, and there's three balls in the fairway. And I'm thinking dang, I really did hit that pretty good. You're not playing Titleist, right? LES LAWLESS: Yeah. I hit a Titleist too, also. -No, I was talking to Randy. RANDY ROGERS: No, that's my ball down there, Shannon. -We must talk about this. I think I out-drove Shannon, which is a good thing because she is a pro athlete, and I'm just a guitar player-singer guy. STEVE ELKINGTON: Oh, that's pretty. RANDY ROGERS: That's going to be good. LES LAWLESS: Kick her left. -Oh. How did that kick right? LES LAWLESS: On her second shot in there. Perfect. Then I don't know what this thing hit. Kicked five yards right on us. Came up short. SHANNON FISH: This is unbelievable. STEVE ELKINGTON: He has just risen to the occasion. -I'm telling you, Elk created a monster today in Randy. I've never seen him get competitive, but when I was looking at him I was, like, he's really trying to beat me right now. STEVE ELKINGTON: Oh, look at my man Randy! 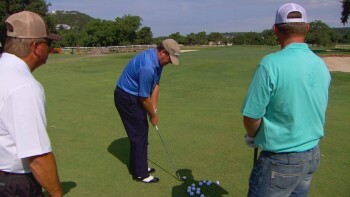 RANDY ROGERS: I was sitting on the green. I don't believe-- I might be pin high. STEVE ELKINGTON: You are pin high. They need a chip in in the worst way. Oh, she's played it well. Stop, please. Wow. Is that quick? SHANNON FISH: I caught a little bit of the slope and ran past the hole. And so now, all the weight's on Les's shoulders. He wanted to change the lineup, which is fine. STEVE ELKINGTON: That's-- that's going to go. That's good. STEVE ELKINGTON: Oh, it came back the other way! SHANNON FISH: The fact that Randy and Elk are 30 feet for eagle, there is no way that they're 3-putting that. STEVE ELKINGTON: One will do. Oh! SHANNON FISH: So we just, kind of, had to stand there and take it. STEVE ELKINGTON: It's got to go. Oh oh oh oh. There it is! -She's hardly even happy about it. -Nice to meet you, Randy. -Nice to meet you, Steve Elkington. STEVE ELKINGTON: We had an unreal day with Randy and Les. It was just so interesting to be around talented guys and see what they do. This is a partnership right here against these two. We're going to play scramble. Hey this is-- this ain't the Big Break, you know. It's not going to be-- this ain't the Big Break. LES LAWLESS: I think it's the camaraderie, the stories. Oh, you should have seen the shot I hit on 5 today. There's a little bit of competition and bragging rights. -Oh! Woo! Where'd that go? LES LAWLESS: But I like to play. SHANNON FISH: Oh, faded too quick. I got to hang out with Elk. -She's grown up at the Champions Club in Houston. -Get his advice. Pick his mind. It means a wealth of knowledge. And then the fact that I can go play golf with Randy Rogers Band. STEVE ELKINGTON: No, that's a good drive. -That's my favorite part about golf is getting to meet incredible people. -Have you ever had the yips? -You know what the yips are? -You know what the yips are? Have you ever had the yips? -Haven't had the yips yet. -Oh, we're not going to be doing that. -That was the glue that put this whole thing together. STEVE ELKINGTON: Today was great. Man, I tell you what, man, I had a really good day today. Thank you, man. I appreciate it. -We had a great time. -Check out those losers over there. STEVE ELKINGTON: Ooh! That's cold! SHANNON FISH: Girls go first! NARRATOR: Elk gives the inside scoop straight from the caddy's mouth. -If he has to worry about you, that's not good. Because he has to worry about what he's doing. -You work for a guy for as long as I have, it says something about the guy. Your number one responsibility. Show up on time. No hangovers during a tournament round. I want the numbers right. And take the blame for everything that goes wrong. -Most of the guys I know have been out here as long as me. They couldn't do anything else, for starters. And they wouldn't do anything else. And they love the game. That's why they do it.